Coconut oil, if you’ve never had to handle it before, looks very similar to crisco when you first see it in its container. I don’t use anything particularly fancy, just Lou Anna’s Coconut oil (because it is within my budget) but you are welcome to use what ever grade, or type of coconut oil you are comfortable with. 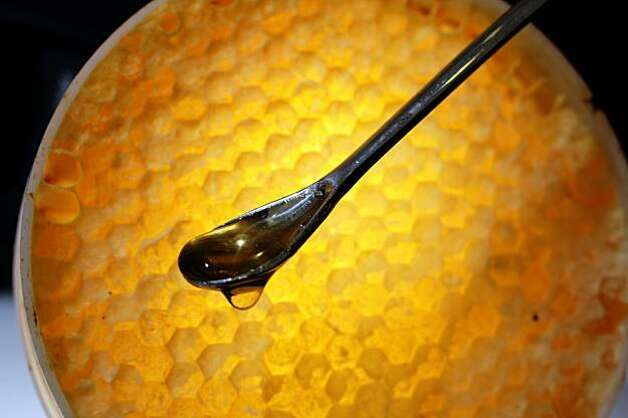 Handling it is very similar to handling raw honey, in that it will need to be warm to be able to mix in with the sugar. Remember, what ever you do, do NOT heat in the microwave, doing so destroys all the lovely enzymes and molecules that will help keep your skin lush! I find it’s easiest for me to measure the coconut oil and the honey into the container I will be keeping the scrub in, sealing it and submerging it in a sink of hot water. It does not take long at all before you’ll notice that the warm water has made both ingredients liquid and easy to combine. Remember to dry off the container and your hands before opening it, and adding the EVOO what ever scents you have chosen (if any at all) until you are happy with the scent. When adding the sugar, you should start slow, and only add as much as you need to get the texture you like. To use it in the shower, just apply a small bit in circular motion to the skin. I use this on every bit of my body, face included! concentrate on areas that are scaly or otherwise dryer than the rest of your skin, or places where you notice blemishes and marks. The stimulation from the sugar and the nutrients from the oil help to increase circulation and repair the skin, thus giving you that gorgeous honey kissed glow! Do not worry about feeling a little oily after rinsing. You really only want to rinse until the sugar is gone (using luke warm water). Afterward, rub the oil into your skin before patting dry with a towel. You will notice that you feel moisturized and lush rather than oily once you pat dry! For those who have never used a sugar scrub this will be a new sensation, but one you grow used to and start to crave in no time! Fantastic news boys and girls: this wahine is about to be a Mommy! . . . in late March. It seems a little late in the game to be informing the world just now, however, I was not informed of the little miracle until week twenty (20)! With all of the changes, and adjustments to this new development, and trying to prepare for a soon to be new life, I have not had a whole lot of time to update . Not everything they say about pregnancy has been true for me, thus far. Morning sickness was fairly benign, cravings are minimal, and often times healthy, and putting on weight, well I managed to go in the opposite direction BEFORE growing a bump. However, my skin has suffered in the moisture department. Finally, at month 7, my poor belly is developing stretch marks; and I think it’s about time to nurture Mommy a bit before baby girl gets here! Enter. . . my the recent BUZZ with Honey! Honey is an absolute skin miracle. Naturally antibacterial and antimicrobial it’s excellent for removing any lingering nastiness from your hard day at work. Heavily moisturizing, and yet slightly drying so it is excellent for drying up any developing breakouts while kissing your skin with enough moisture to make you GLOW. That is right, darlings, you too can get the glow of pregnancy without the bumps! And for those us of who have some lingering scars from acne, honey helps naturally repair skin and lessen the look of said marks and pocks! Before I start posting the recipes for your honey soaked adventure; a moment to educate you in the differences in the ingredients you use. Completely raw honey is unheated, unfiltered, and un-strained and will often times still contain bits of honey comb, propolis, wax and pollen. It crystallizes easily, but do not fret, crystallizing does not mean that your honey has gone bad. This is the most beneficial form of honey as it still has all of its enzymes and good bacteria in tact. While some whole foods stores will carry honey similar to this, I encourage you to shop your local farmers market. Not only are you giving back to your local farmers, but you know where the honey is coming from and that it is every bit as raw as they say it is! And your wallet will thank you too. Raw unfiltered honey is strained to get the larger pieces of honeycomb, propolis (the sticky substance used to seal beehives which is also a very effective anti-inflammatory and antimicrobial substance), wax and pollen out of it. It may have also been heated to just below the the “acceptable” raw standard to aid in the straining process. Thankfully this process is not totally damaging to the enzymes and so this is a great second choice if completely raw honey is not available to you. While delicious, creamed or spun honey has most likely been pasteurized, crystallized and ‘spun’ to give it that creamy spreadable texture. Most of the beneficial properties of honey have been removed in the heating process and while you can still reap the glowing affects of honey kissed skin, you’re not doing yourself any favors by shooting for this breakfast table staple. Keep in mind that honey does NOT go bad. If it crystallizes never fear, placing the sealed jar or container in a bowl of warm water for a bit will smooth it out and give you back that smooth honey you so crave. Also, don’t let the flowery labels confuse you. The flower distinction does not affect the enzyme/vitamin content of your honey. It does however give each one their own unique flavor. I still highly recommend trying the whole range of flowery honeys, not just for your skin, but your tummy as well. It’s the most delicious experiment around!